I tried a new biscuit technique, and the outcome was amazing! So I, of course, had to share. :) I’ve read that when making puff pastry from scratch, which I have yet to do LOL, you fold the dough over itself a bunch of times to make it flaky. I thought I’d see what happened if I tried this with my biscuit dough, and the result was the fluffiest and flakiest whole-wheat biscuits I’ve ever had. My kids could not get enough of these things, and it was very easy to do so I hope you’ll give the recipe a try yourself. Let me know how it goes! Preheat oven to 450 degrees F. Combine the flour, baking powder and salt in a large bowl. Whisk together. Cut the cold butter into pea-sized pieces and work it into the dough using a pastry blender tool or the back of a fork (or your hands - just use your fingers to squeeze the flour-covered butter into smaller pieces). Stir the buttermilk in with a fork until just combined. Turn the dough out onto a floured surface and sprinkle more flour on top. Fold the dough over itself and pat it back down 15 or 20 times. Use your hands to pat it into one thick piece about 3/4 to 1" thick and cut out shapes with a cutter or small glass turned upside down. Spread out the pieces on a baking sheet and bake until fluffy and golden brown on top, about 10 to 12 minutes. Serve warm and freeze the leftovers for a rainy day. Biscuits and gravy are on the menu this week, I’m going to try this recipe. Thank you! I have used 1Tablespoon of vinegar then fill the rest of the cup with almond milk, let it sit for 5min, and you’ve got a great substitue for buttermilk. The recipe I used it in was for buttermilk pancakes and they turned out great. I have and it worked the same! I use Earth Balance (sticks) and almond milk and the biscuits are yummy! Also, I use regular whole wheat flour, but sift it. Lisa – Thanks for the tip to help make them fluffier, I will try that next time. I have used vinegar with almond milk to make buttermilk alternative – I prefer lemon juice, both do the same thing, I prefer the scent of lemon vs vinegar. It works great. Do I need to use a pastry blender to get the same results or can I use my food processor? I have no problem cutting in shortening by hand, but cold butter takes a lot longer. My favorite cheat with cutting in butter is to freeze it and then grate it with a box grater. It stays nice and firm and grating it allows you to cut it in so quickly. If you grate it and need to keep it cold just put it back in the fridge/freezer. It is a great cheat with biscuit and scone making! So I finally got around to trying this recipe and my oldest daughter delcared it her and favorite biscuits (after cheddar chive biscuits)! And bonus, they are 100% whole wheat. I usually do 2/3 wheat 1/3 white flour to keep my usual drop biscuits from becoming too dry and crumbly. Not sure if the difference, was butter instead of sustainable palm shortening, but I will switch to making biscuits this way from now on! Next time, I will try adding cheddar and chives to this recipe to see if it becomes my daughters ultimate favorite. That is the way it used to be done. Turn the dough out onto a floured board and knead lightly. BTW, whole wheat pastry flour can sub for all-purpose in a great many recipes. Did you use 2 cups of pastry flour by weight or volume? I ground soft white wheat (what is usually used for pastry flour), and by weight, the dough was really, really wet. I had to add a lot of flour. They were still delicious, but I’d love a clarification for future use! Can you use regular whole wheat flour, or does it have to be pastry specifically? I’ve made biscuits with both. They’re fine with regular WW flour, by fluffier and more tender with the pastry WW flour! I agree you can sub regular ww flour, but it would be better with ww pastry flour – definitely worth the purchase! Grating frozen butter is a great trick for biscuits – thanks for the reminder! Hi. I don’t have pastry flour. Can I use regular wheat flour? You can – it won’t be as light and fluffy, but it will work. Good luck! 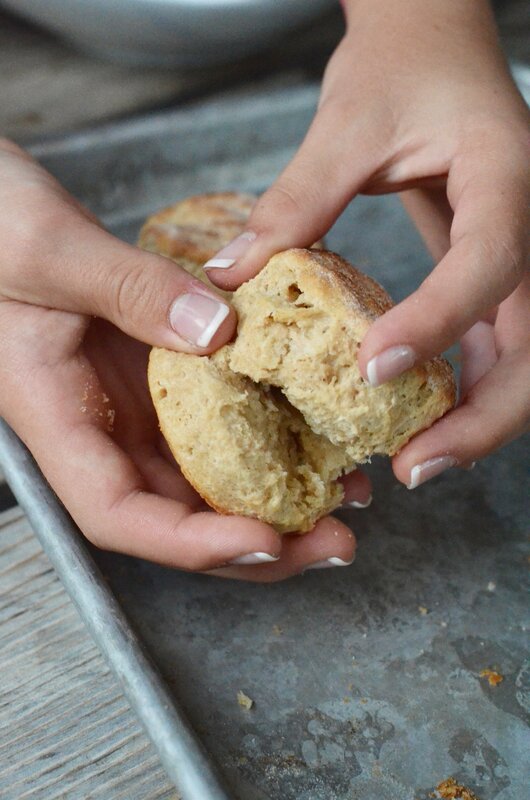 What makes these fluffier than your Super Easy Whole Wheat Biscuits? Is it the pastry flour and buttermilk? Definitely the folding technique and also the pastry flour! These was fantastic only my biscuits didn’t fluff up as much as shown in the picture, but they were still delicious and everyone gobbled them up! Made them to go with the cracker baked pork chops—yum! what a great tip and great idea to apply the puff pastry fluff technique to biscuits! Love that they are whole wheat too as an extra bonus! Thank you for sharing this tip and recipe! hi, thanks for this recipe. had to make these for a pot luck and they turned out great. i did add 2 teaspoons of baking powder though, just to make sure they rose right. i also made my mock buttermilk with a tablespoon of vinegar to the milk amount. turned out light, fluffy and tasted amazing! i’ll be making these with all the soups i make during the winter. yum! I’d love to make these and freeze some! No problems with freezing? Once frozen, would you recommend thawing at room temperature? Yes. I thaw these on the counter. Cant wait to try these! My family doesn’t love whole wheat, but I think these may change their minds! 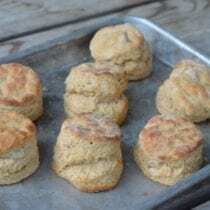 I have tried these and the original recipe and my biscuits come out 1/4 to 1/2 the size of the ones you pictured each time. I use WW pastry flour, don’t “over work” the dough and folded about 10 times. Mine are more the thickness of a hockey puck than a biscuit. Thoughts? Hey Tara. Sorry for the delay. Were all your ingredients fresh? Sometimes old baking powder can be the culprit. Excuse my ignorance but what kinds of things can these be used for? Sweet or savoury? I am from Australia and I’ve never really seen these… look good though! Just saw this EXACT recipe on another blog. Must be pretty good! 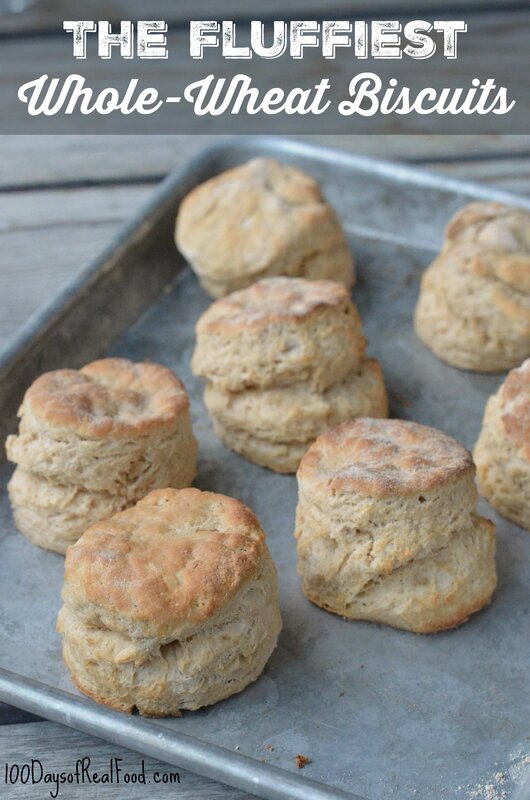 these are the best biscuits i ever made!! thank you !!!!! Lisa these biscuits truly are the BEST!!! They are so soft and fluffy. I add a tablespoon of coconut sugar since we prefer slightly sweeter biscuits. The flavor is perfect! Delicious, budget-friendly & very easy. My kids won’t eat whole-wheat bread but love these. They make a great snack or side.